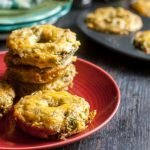 These low carb western omelet bagels are a delicious and convenience breakfast choice. Add oil to a large skillet and then add the onions and peppers. Saute until slightly browned, about 10 minutes, and then set aside to cool. In a a small bowl, mix the almond flour, flax seed, baking soda, salt and pepper. In a bigger bowl beat eggs and the mix in the 3/4 cup of cheddar cheese. Add the dry ingredients to the eggs and mix well. Grease your bagel tin and then spoon in the egg mixture. Smooth over the tops and then sprinkle the remaining cheddar cheese. Bake for 12 minutes or firm to the touch. Freeze individually if you wish.